Inevitably, the more popular something gets, the bigger the chances of problems and controversies. 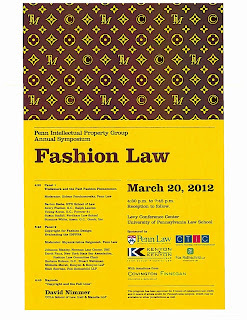 And it was no different even for Fashion Law. 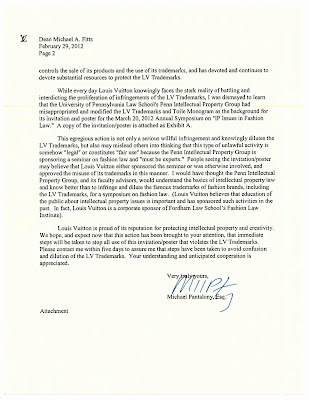 On February 29, 2012, Louis Vuitton sent a Cease-and-Desist letter written by Michael Pantalony, Esq., Director of Civil Enforcement at the French maison to the University of Pennsylvania Law School ("Penn Law"). 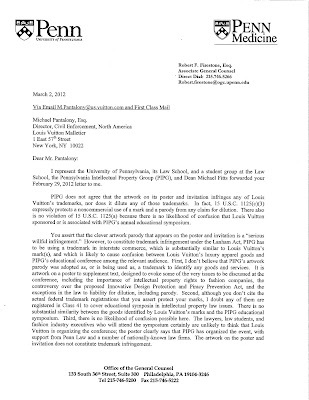 The letter referred to the flyer of an academic event, a symposium about Fashion Law, organized by the Penn Intellectual Property Group, which allegedly violated Louis Vuitton's "Toile Monogram" trademark. 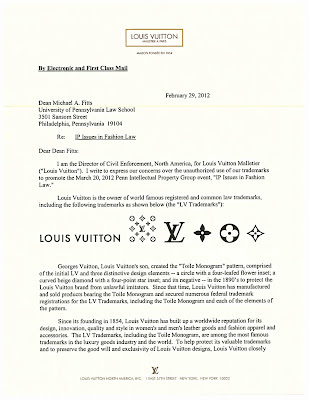 The flyer played with the "TM" and "©" symbols in the LV monogram as a reference for the subject of the symposium. 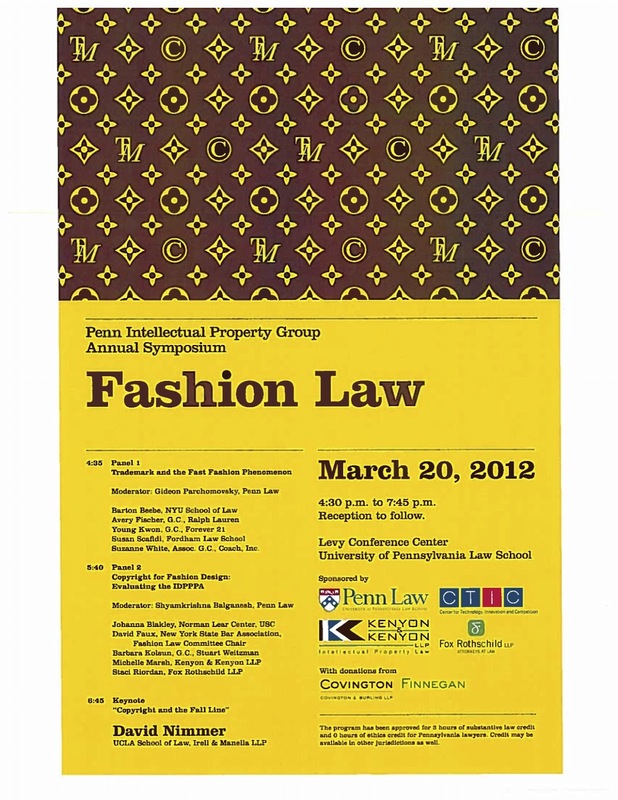 I [Michael Pantalony] would have thought the Penn Intellectual Property Group, and its faculty advisors, would understand the basics of intellectual property law and know better than to infringe and dilute the famous trademarks of fashion brands, including the LV Trademarks, for a symposium on fashion law. 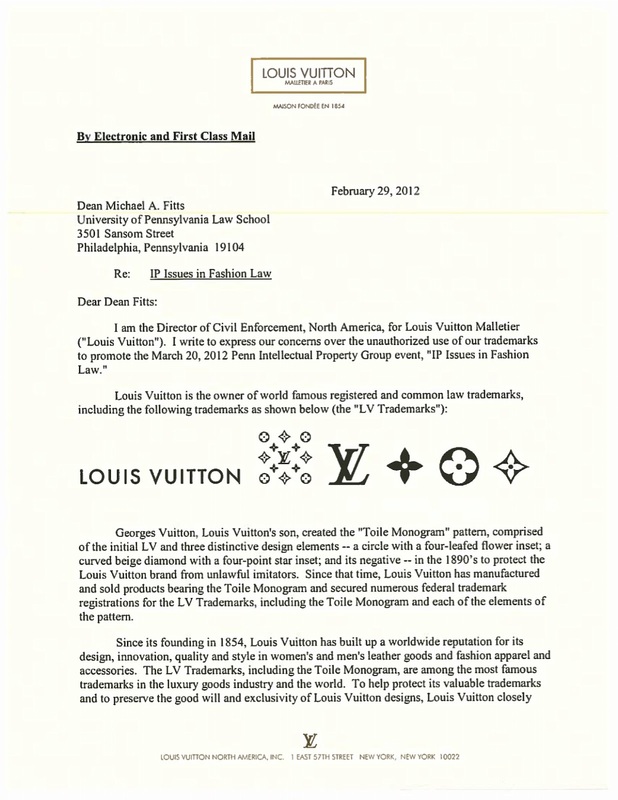 Penn Law, however, was not intimidated by Louis Vuitton. 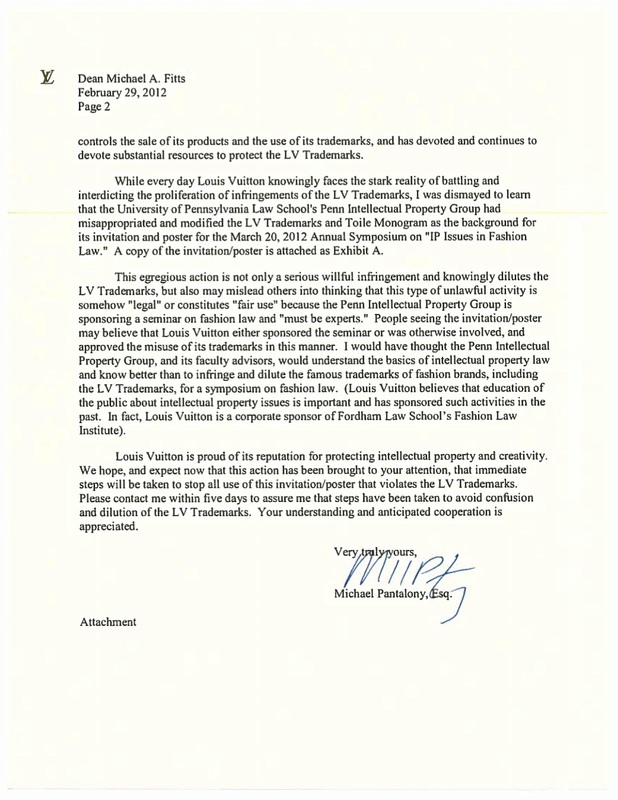 On its reply sent on March 02, 2012, counsel Robert Firestone disagrees with LV infringement allegations and argues that there would only be a trademark violation if the "artwork parody" (as he calls it) was used in interstate commerce, likely to cause confusion the LV's luxury goods. 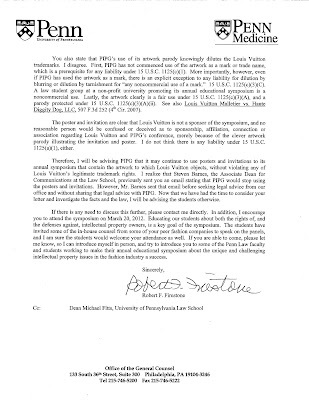 He contends that the artwork parody was not used to identify any goods or services, but rather created to supplement a text on a flyer; that LV trademarks are probably not registered in international class 41to cover educational symposia in intellectual property law issues; and thirdly, that there is no likelihood of confusion, since the attendees of the symposium (mainly students, lawyers and fashion industry executives) are unlikely to think that LV is organizing the event. 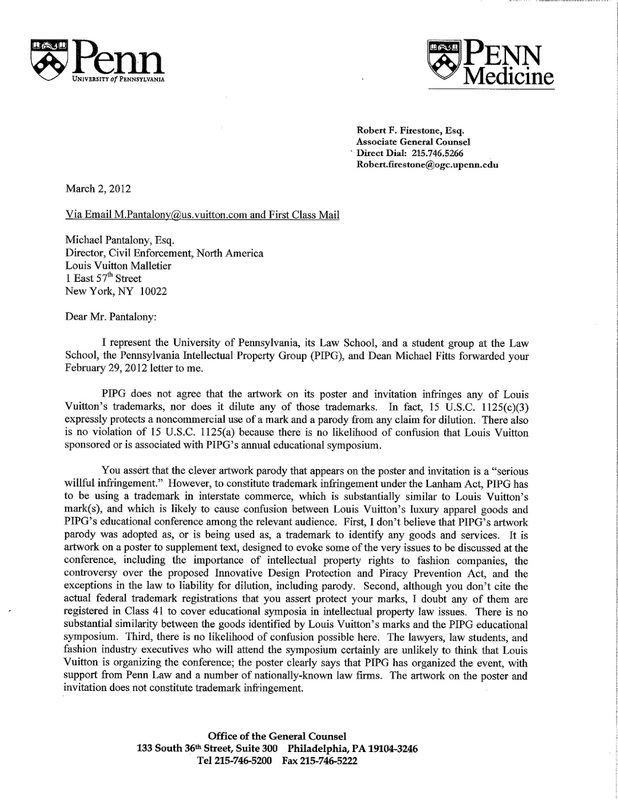 As far as for the dilution argument, Firestone says that Penn Law did not use the artwork as a mark or trade name, prerequisite for any liability under the Lahham Act (US federal trademark law statute). 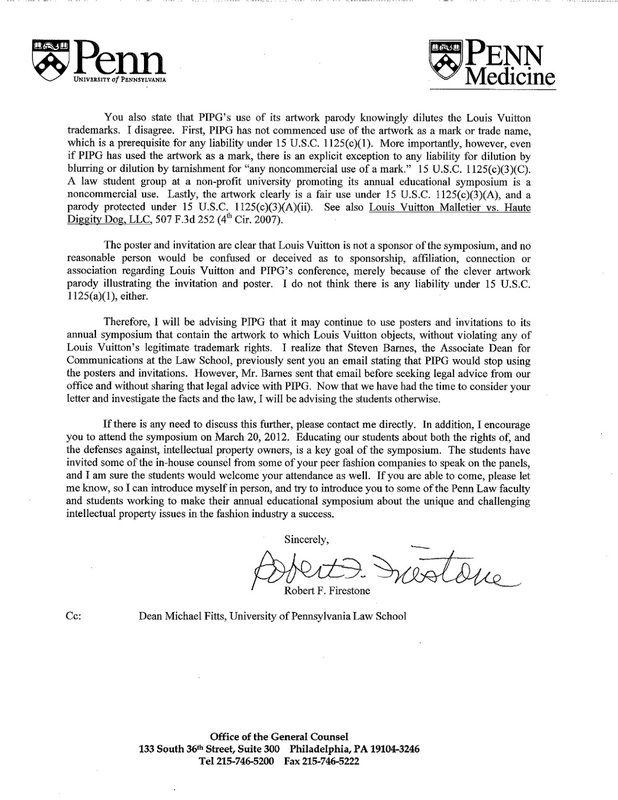 He also mentions that even if the Penn Intellectual Property Group used the artwork as a mark, it would fall under the exception of "any noncommercial use of a mark".